Story & Photos by Melissa Burke | Rapid City, S.D. State qualifiers for the 2012-2013 Make it With Wool competition. It was a busy yet enjoyable two days as producers met in Lead, S.D., at the Days Inn Hotel and Convention Center for the 75th annual South Dakota Sheep Growers Association convention, held September 28-29. In conjunction with the convention was a separate but related event, the Northern Plains Sheep Symposium. Topics covered in both events included sheep health, nutrition, reproduction, predator control, wool and marketing. Speakers included extension specialists, industry experts, and government agencies from several surrounding states. Kicking off the symposium on Friday was the first speaker, Dr. Rodney Kott. Sheep Specialist at Montana State University (MSU), Dr. Kott discussed “Economically Important Traits and How They Relate to Visual Appraisal,” part one of the topic “Selecting Superior Rams.” He began by listing three ways rams are chosen. Visual selection is the simplest, but is risky since it’s based on best guess. Selection by using performance records is based on best guess plus the animal’s own performance. Third is selection by genetic evaluation, which is based on best guess plus animal’s own performance plus performance of the parents and progeny. Many things drive profitability, but only three things drive genetic progress in the flock. These include the rams you buy, the ewe lambs you keep and the ewes you cull. Of these three, the rams have the greatest influence. “The ram is what drives what you do,” emphasized Dr. Kott. To make good progress, the rams that producers buy have to be substantially better than their ewes for the trait they want to improve. These traits could include number and weight of lambs raised, or weight and grade of wool obtained. Twin lambs should be marked in some way, such as by notching ears. At weaning, sort out ewe lambs using the marker. Select replacements from these or from the dam’s history of twinning. Dr. Lisa Surber, MSU Wool Lab Supervisor and Research Scientist, continued with the topic “Selecting Superior Rams” in her presentation “Tools We Can Use to Put the Odds in Your Favor.” Dr. Surber stated that EPD’s are now being selected in rams — ultimately impacting the female offspring being kept. She also explained the Profitability Index as it pertains to sheep. This index is part of a collaborative effort between MSU and Virginia Tech using the Targhee National Sheep Improvement Program (NSIP) data base. The index helps select for reproductive efficiency and puts negative pressure on mature body size. “Bigger ewes have bigger lambs,” stated Dr. Surber. Sheep can get too big, however, and efficiency is compromised. American lamb has a competitive advantage over imported lamb due to its increased loin size. “Loin size has a direct effect on dressing percentage. It is also the best predictor of carcass merit,” Dr. Surber explained. It is important to be aware that when ultrasounding the loin, you are actually measuring depth of muscle and not the area. “ Lamb production actually begins two weeks prior to breeding,” he began. The health of the ewe can impact the health of the lamb, and a pregnant ewe will sacrifice herself to provide for the lamb. The lamb inside the gestating ewe must be protected from abortion as well. Among the biggest dangers are Campylobacter, Toxoplasmosis, and Chlamydia pathogens. These can be guarded against through vaccination and/or feed additives. The ewe goes through mid gestation mainly by herself, as long as she doesn’t get too fat. In late gestation producers need a pregnant ewe in moderate body condition, one that is gaining weight and is competing with the flock at the feed bunk. At lambing they need a vigorous, aggressive lamb that will seek out the udder and find the teat on its own. Sanitation is very important, as is protection from drafts. Lambs can become hypothermic quickly, particularly if they don’t nurse. Scours and pneumonia are two more potentially fatal afflictions. “Since sheep are a prey species,” said Dr. Goelz, “they won’t exhibit signs of weakness or illness. If they do, they’re vulnerable to predators.” A sheep that dies often was not detected as sick and treated early enough to have a reasonable chance at treatment success. Why are these sick lambs being missed? Mostly because of other commitments such as feeding sheep; therefore, time for observation is limited. If feeding time is minimized, more time can be spent managing the lambing and intervening when necessary. Fence line feeding with a pull type feeder is one option. Also, labor saving watering tubes can be installed. Sometimes lambs must be tube fed, and they can be artificially reared by feeding milk replacer, free choice feeding from a bucket, or by using a milk machine if possible. Dr. Goelz reminded the audience that without a diagnosis any health problems can’t be addressed. If you find you’re in over your head, get help from a veterinarian. “Establishment and Potential Use of Forage kochia” was addressed by Mr. Brian Sebade, Wyoming Extension Educator. Forage kochia (Kochia prostrata) is different than annual kochia (Kochia scoparia.) It is a perennial semi-shrub introduced from Eurasia that has been cleared by the USDA for use and planting. An excellent winter forage, it boasts protein levels of up to 15 percent. Its stems rise up above the snow for browsing, and it may possibly cut winter feed costs. During the summer it provides a green strip for fire breaks. Forage kochia has been established in northeast Wyoming. It was test planted in the winter of 2010-2011 near Gillette, Wyo., and in January 2012 near Hulett, Wyo., and in an area south of Alzada, Mont. Near Hulett and Alzada the results were only poor to fair, but the Gillette area planting worked well. It is believed that more moisture there made the difference. “The time to plant forage kochia is November through March,” instructed Sebade. Seed should be broadcast over the snow at the rate of one to three pounds per acre. “Seeds are only viable for one year, so be sure to get seed the same year you plan to plant,” he cautioned. A prepared seed bed is best, and most research suggests planting with a grass component. It will grow in most any type of soil. If established, see how animals perform on it, keeping in mind that it does have the potential to spread. As with most anything, try it in small quantities at first. Following the noon luncheon on Saturday was the presentation of awards for the 2012 South Dakota Master Lamb Producers. The top Feeder Lamb producers were Clay and Molly Olson of Newell, S.D. They have a range-based operation in which they run 650 mature Rambouillet ewes and 200 yearling ewes. The top Lamb to Finish producers were Joel and Bonnie Foster of Brookings, S.D. They have a drylot-based operation which includes 125 commercial Montadale ewes. They also run a farrow to finish hog operation and farm some cropland. 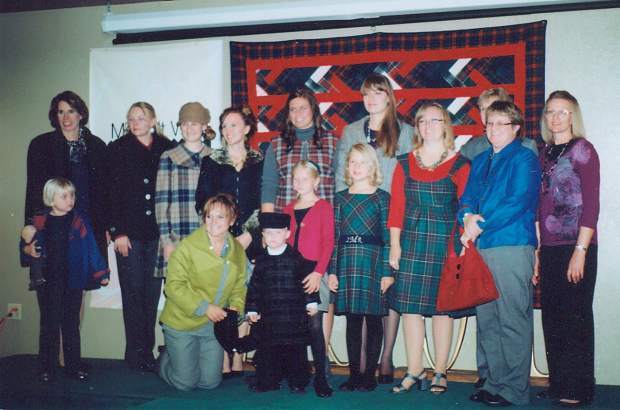 The Saturday evening program featured an auction to raise funds for the Association, a banquet in which leg of lamb was served, and the State finals of the Make it With Wool competition. Some of the items sold at auction were jars of locally grown honey, jewelry, a farm sign, insulated coveralls, a Pendleton wool blanket, framed pictures, and even a Rambouillet ram skull mounted on a wood base.